Lamont didn’t like visiting his Aunt Moira. She pinched his cheeks and ruffled his blond hair every time she saw him. Sometimes she even kissed him and he definitely didn’t like that. "Mum, can I go down to the loch and throw some stones in?" he asked softly, not wanting Aunt Moira to hear. His mum, seeing his boredom, answered, "Sure, Lamont, go ahead. Don’t get too close. The water is very deep and very cold." Without wasting another minute, Lamont ran out the door and headed to the loch. He ran past a sign that read, "Loch Ness – Home of the Famous Loch Ness Monster." He didn’t pay any attention to it though. The first time he’d visited his Aunt Moira, his mum and dad had told him that there was no such thing. It was just something the people here said to get tourists to come visit the loch. Lamont had no reason not to believe them. He ran to the shore of the loch. He looked around for some stones he could toss in. He walked around gathering them in his pockets and then stood on a large rock. He threw one of the small stones as far as he could. SPLASH! It landed in the water and sunk quickly to the bottom. Again, he tossed another stone. SPLASH! It went further than the first one. He stood for several minutes throwing his stones. SPLASH! SPLASH! SPLASH! "This isn’t any fun," he mumbled to himself. He jumped down off the rock and walked along the shore. He came to some reeds that blocked his way. He could go no further. He stopped and sat down on a grassy ledge. He threw a stone into the reeds. SPLASH! The water seemed very deep there. Not only did the stones make a splashing sound, but they also went KERPLUNK! He threw another stone, but instead of hearing a SPLASH and a KERPLUNK, he heard "OUCH!" Lamont stopped. "Who’s there?" he asked. Nobody answered. He threw another stone. Lamont jumped up and ran over to the reeds. He parted them. In the water, among the reeds was a huge dinosaur-like animal. It was green, had nubby little horns, and was rubbing its head. "Ouch," she said. "That hurt!" Lamont stood there, unable to move. "Sorry," he whispered. "Well, all right. I accept your apology. But from now on, please try to be more careful," the monster said. She looked over at Lamont and saw the curious look on his face. "I’m Nessie, otherwise known as the Loch Ness Monster. Who are you?" Lamont, for some reason, wasn’t afraid. He answered, "I’m Lamont. I’m here visiting my Aunt Moira. She pinches my cheeks and rubs my hair." Nessie started to laugh. Her laugh was loud. Lamont looked at her. Only her head and long neck were out of the water. Triangular spikes stuck out from the center of her neck. She had bits of plants hanging from her mouth. He could see that she had sharp teeth and could eat him in one bite if she wanted. She was huge! "Are you really a monster?" Lamont asked. "I guess I’m more of a dinosaur than a monster. I only eat plants, not little boys," she assured Lamont. "Say, would you like a ride on my neck?" Lamont looked at Nessie. "How big are you anyway?" he asked. "Well, I’m about 100 feet long. I’ve got humps, I’m very thin, and I’ve got feet and arms, but I only use them when I swim. Now, would you like a ride around the loch?" she asked again. Lamont nodded yes. "Climb on my head and hold on," she said. Lamont grabbed onto her stubby horns and found a place to sit, holding onto one of her spikes. "Ready?" she asked him. "Let’s go, Nessie," he said, excited and anxious. He knew his mother wouldn’t like this, nor would his Aunt Moira, but he wanted to go. She took off and soon they were swimming around the loch. Lamont kept his feet out of the water and tried not to let the water splash on him. "Wheeeeeeeee!" he called out with glee. "This is fun!" Nessie swam all the way around the loch. Lamont could see sheep grazing on the hillside, lots of pretty flowers growing along the banks, and even saw a small waterfall cascading over some rocks. "Would you like to see my cave? " Nessie asked. "Where is it?" Lamont questioned. "It’s under this hill. I live in a huge cave. It’s got tunnels going out from all directions. I can swim into other lochs. It’s very comfortable for a Loch Ness monster," she explained. "I"d love to see your cave," Lamont answered. "Then hold on, take deep breath and here we go!" Nessie gave Lamont time to hold his breath, and then she dove under the water. He held on tightly. The water was very cold. It only took a minute to reach the cave. Lamont saw how Nessie used her hands and feet as flippers to swim quickly. Soon she came out of the water into the cave. "WOW!" Lamont exclaimed. "This cave is huge! Look at all the tunnels too," he said, looking around, trying to see if he could see down one. They were filled halfway with water. Lamont saw where Nessie slept. It was in a big pile of dried heather. He saw some plants that she must have been eating. "I’m sure your cold. Let’s get you back up to the top," Nessie said. "Hold on again and take another deep breath," she urged. Lamont did just that. Before he knew it, he was back up on the surface, right near the reeds where he’d been throwing rocks. He climbed off Nessie’s back and stood on the shore. "I’ve got to go now," Nessie said. "The next time you come to visit Aunt Moira, come down here to this spot and throw stones in the water and I’ll come and say hello." Nessie smiled at Lamont, and dove under the water. Lamont stood there, dripping from head to toe. He felt very cold. Just then he heard, "Lamont, why are you all wet?" It was his mum. She’d come looking for him. "You are drenched and freezing. Did you fall into the loch? Oh never mind, let’s just get back up to Aunt Moira’s and get you into some dry clothes!" She took Lamont’s hand and led him up the hill towards the warm cottage. Before he went inside, he turned and looked back at the loch. 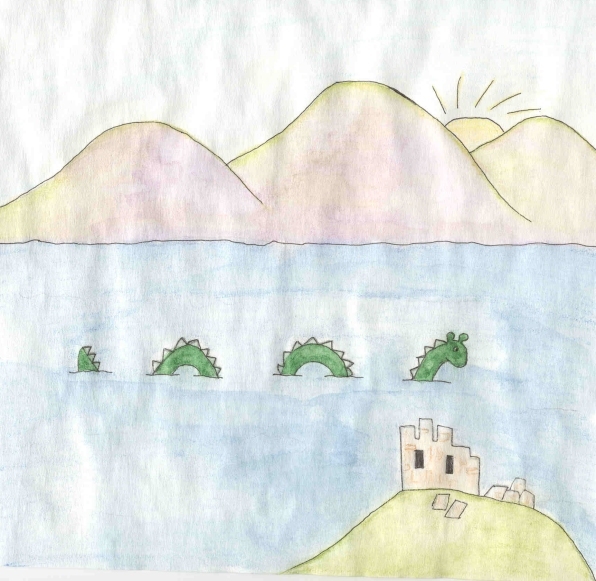 There was Nessie, in the middle of the lake. She was looking at him. He waved goodbye to her and then she went under the water. He could see her three humps. His mum turned around and saw the humps sticking out of the water. "Oh my. Did you see that, Lamont? Did you see those humps? I think we just saw the Loch Ness monster!" She stood there pointing at it. "I saw it! I saw the Loch Ness monster." "Mum, I’m cold," Lamont complained. "Yes, you must be," she said, looking down at him. "Let’s go in the house now." She opened the door and he went inside. She turned and looked out at the loch and saw nothing. "I must have been imagining it," she said and went inside.